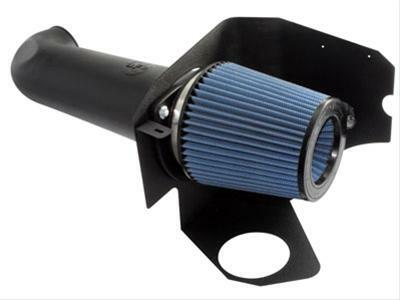 aFe Magnum Force Stage 2 Pro 5R air intake systems outflow and outperform your factory intake. Using durable, one-piece, 16-gauge powdercoated heat shields, the Stage 2 intakes feature aFe's Pro 5R air filters that improve airflow for increased horsepower and torque. Magnum Force systems also utilize precision-designed, heat-insulating, roto-molded intake tubes that increase airflow with improved volumetric efficiency for maximum performance. With five layers of progressively finer mesh cotton gauze media between a 100 percent polyurethane top and base, Pro 5R high-flow, "oiled", conical filters are washable and reusable for multiple cleanings. Their tall, open, evenly spaced pleats provide excellent dust-holding capacity for longer service cycles between cleanings. A pliable polyurethane flange with integrated bumps assures a tight, no-leak seal over the life of the filter. Easy install, easy maintenance, and more power--what's not to like about aFe Magnum Force Stage 2 Pro 5R air intake systems? CARB EO Number:D-550-22. Filter material: Blue Cotton gauze. Fits 5.7L and 6.1L Hemi models only.